Valley Zipline Adventures Presents ….. their first annual FRIGHT NIGHTS!!!! 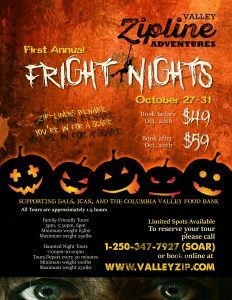 Valley Zipline Adventures is extremely excited to bring you their first annual FRIGHT NIGHTS. This inaugural event at Valley Zipline Adventures will run nightly from Friday October 27th until Tuesday October 31st. At Valley Zipline Adventures Fright Nights you will see their regular zipline tour transformed into a haunted tour unlike anything you’ve experienced before. A more family friendly tour is available between 5-6pm each night. At 7pm the sun has gone and you will be ziplining our haunted tour in the dark. Ghouls and Ghosts await, so this tour is not for the faint of heart. Not only has Valley Zipline Adventures decked out their course with the scares of Halloween, but they have also dropped our rates. The rate is $49.00 per person before October 20th 2017, after this they are $59.00 (+tax). This is their last week of operation for the 2017 season, so don’t miss this Spooktacular event. Did you know? 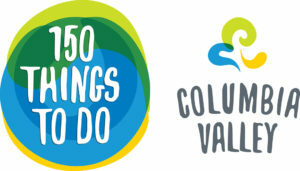 Valley Zipline Adventures is listed on of the Travel Columbia Valley’s 150 things to do in the Columbia Valley? Just click on the image below for the full list!